On Saturday, March 25, Leaders of the current 27 EU member countries gathered in Rome to mark the 60th anniversary of the European Union's founding treaties, signed in 1957 by Italy, France, Germany, Belgium, Holland and Luxembourg. The first agreement established the European Economic Community (EEC), with the aim of creating a common market and favoring trade. The second treaty gave birth to the European Atomic Energy Community (Euratom), to coordinate the Member States' research programs for the promotion of the peaceful use of nuclear energy. Saturday's anniversary was an opportunity to revive the common European project through the signing of the Rome Declaration in which member countries have renewed their commitment for a Europe that is "safe", "prosperous and sustainable", "social" and "stronger on the world stage". 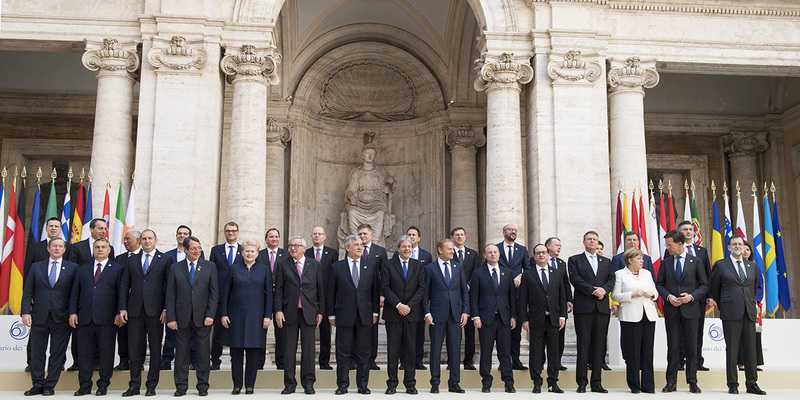 Many of the topics included in the Rome Declaration are consistent with the priorities of the Italian G7 Presidency. For instance: the need for an effective, responsible and sustainable migration policy, in line with international standards, which can guarantee citizens' safety. As for economic development, the 27 member countries highlighted their commitment to a more prosperous and sustainable Europe that promotes economic and social progress -- encouraging free and fair trade; competitiveness and innovation; a "positive global climate policy"; greater cohesion and convergence in favor of gender equality and of the struggle against inequality, poverty and discrimination. All these targets are also part of the Italian government's agenda for the G7 Summit to be held in Taormina on May 26-27.